Anomalous origin of the right coronary artery (RCA) from left aortic sinus is a rare anomaly causing myocardial ischemia and sudden death. We report a case of a young 17-year-old patient who presented with symptoms of angina. 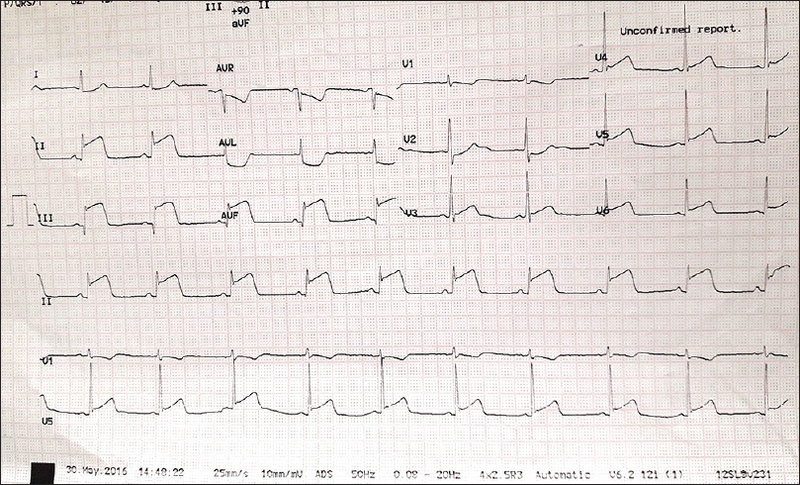 A 17-year-old boy presented with symptoms of angina at rest. Electrocardiogram (ECG) showed ST elevation in leads II, III, arteriovenous fistula, and ST depression in leads I, accessory vein ligation suggestive of inferior wall myocardial infarction [Figure 1]. His creatine phosphokinase (MB) was 121 U/L (normal range 0–25 U/L). Coronary angiogram showed normal left main coronary artery from the left aortic sinus. The RCA had anomalous origin from left coronary sinus. There was no evidence of any obvious narrowing of RCA in conventional angiogram [Figure 2]a and [Figure 2]b, [Video 1] and [Video 2]. He was treated with oral aspirin, paracetamol, and beta blocker. His symptoms improved over the next 12 h with normalization of ECG. Computed tomographic (CT) coronary angiogram showed RCA originating from left coronary sinus had a course in between aorta and pulmonary artery. Careful analysis of the right coronary anatomy in different stages of cardiac cycle showed adequate RCA caliber in diastole (taken at 70% of RR interval). In end systole (taken at 35% of RR interval), the RCA was compressed at the origin in it is inter-arterial course [Figure 3]a, [Figure 3]b and [Figure 4]. He underwent surgical repair at another hospital in view of RCA compression causing ischemia and is doing well without any further ischemic symptoms. Anomalous origin of coronary artery from opposite coronary sinus is reported in up to 0.84% cases referred for CT coronary angiogram. The RCA from the left coronary sinus constitutes 15% of the anomaly. It can have a smaller orifice, an acute angle of origin, and a narrower diameter of the proximal RCA. 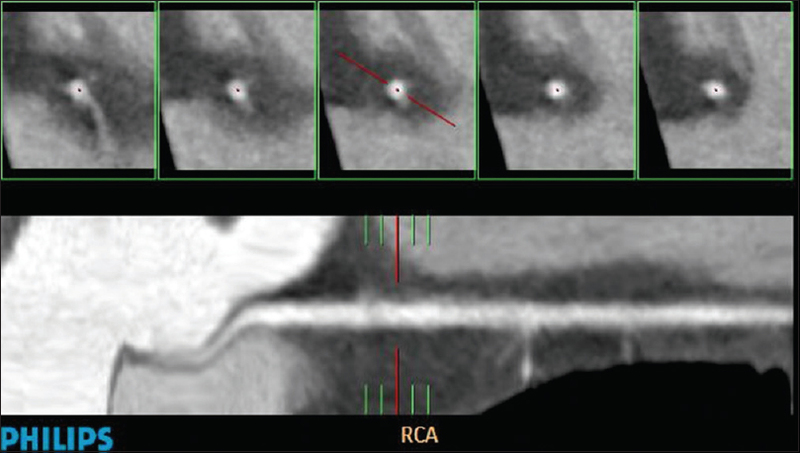 The takeoff angle of anomalous RCA with an inter-arterial course is correlated with the relative narrowing of luminal diameters at the orifice and the inter-arterial course causing ischemia. Two types of the inter-arterial course of anomalous RCA is described. In the high inter-arterial course, the anomalous RCA courses between aorta and pulmonary artery. It has a high possibility of getting compressed during systole. The low inter-arterial course variant has the anomalous RCA running between aorta and right ventricular outflow tract (RVOT). During systole when the aorta distends, the RVOT contracts and the change of RCA compression is lesser than the high inter-arterial course of RCA. Most cases show a benign course. The narrowing of the coronary artery may not be well visualized in the conventional coronary angiogram as noted in the index case. Dual-source CT can clearly show the anomalous origin, orifice, angle, and course of RCA and dynamically evaluate the diameter changes of proximal RCA during the cardiac cycle, providing useful clues to clarify the mechanism of myocardial ischemia. Anomalous origin of coronary artery from opposite sinus is a rare entity which can cause the symptom of myocardial ischemia and arrhythmia and could potentially/lead to sudden cardiac death. Careful anatomical evaluation with an accurate imaging modality such as CT coronary angiogram helps is diagnosis and management plan. In the symptomatic high-risk patients, surgical intervention is the definite repair, and a good long-term outcome can be expected. The asymptomatic low-risk patients can be followed-up closely with exercise restriction. Andreou AY, Ioannides MA, Avraamides PC, Georgiou GM. Aberrant right coronary artery origin from the left aortic sinus with interarterial course manifesting acute myocardial infarction. Exp Clin Cardiol 2009;14:50-2. Opolski MP, Pregowski J, Kruk M, Witkowski A, Kwiecinska S, Lubienska E, et al. Prevalence and characteristics of coronary anomalies originating from the opposite sinus of Valsalva in 8,522 patients referred for coronary computed tomography angiography. Am J Cardiol 2013;111:1361-7. Lee BY, Song KS, Jung SE, Jung JI, Chun HJ, Park CB, et al. Anomalous right coronary artery originated from left coronary sinus with interarterial course: Evaluation of the proximal segment on multidetector row computed tomography with clinical correlation. J Comput Assist Tomogr 2009;33:755-62. Lee HJ, Hong YJ, Kim HY, Lee J, Hur J, Choi BW, et al. Anomalous origin of the right coronary artery from the left coronary sinus with an interarterial course: Subtypes and clinical importance. Radiology 2012;262:101-8. Sato Y, Inoue F, Kunimasa T, Matsumoto N, Yoda S, Tani S, et al. Diagnosis of anomalous origin of the right coronary artery using multislice computed tomography: Evaluation of possible causes of myocardial ischemia. Heart Vessels 2005;20:298-300. Izgi C, Feray H, Erdem G, Kaya Z. Anomalous origin and interarterial course of right coronary artery associated with angina and proven ischemia. Int J Angiol 2014;23:271-4. Gersony WM. 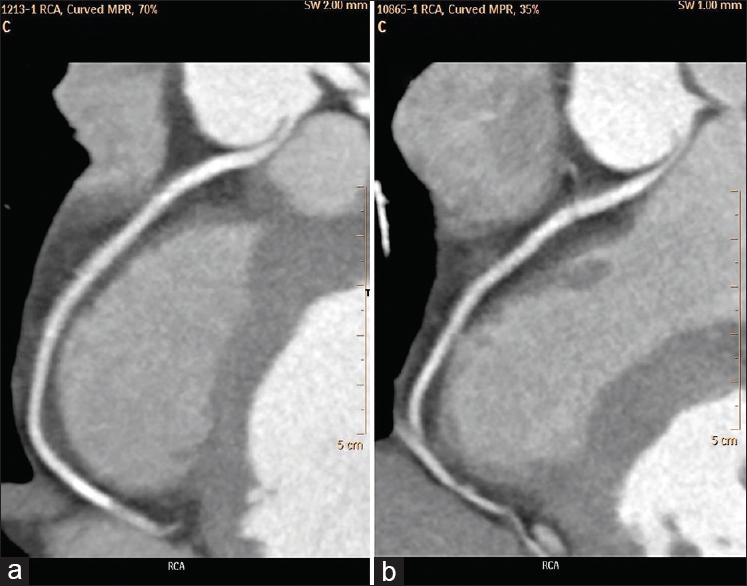 Management of anomalous coronary artery from the contralateral coronary sinus. J Am Coll Cardiol 2007;50:2083-4. De Pooter J, Van Driessche L, Bartunek J. Aberrant right coronary artery arising from the left sinus of Valsalva with an interarterial course. Acta Cardiol 2014;69:185-8. Law T, Dunne B, Stamp N, Ho KM, Andrews D. Surgical results and outcomes after reimplantation for the management of anomalous aortic origin of the right coronary artery. Ann Thorac Surg 2016;102:192-8.